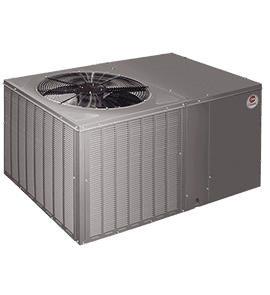 The 2-5 ton Rheem SEER RQPM Dedicated Horizontal Package Heat Pump units feature earth-friendly R-410A refrigerant. This platform provides you with a full line of capacities that are each AHRI-certified. Our cabinets have a powder painted finish that protects them from the harshest weather extremes. And our louvered condenser compartment is the best in the industry for protecting the condenser coil against yard hazards and weather extremes. There is a One-piece top with a drip lip to help keep water off of the unit sides. Supply and return air openings feature a one-inch tall flange to prevent water migration into the ductwork. Access panels have “weep holes” and channels to further help manage water run-off. Easily accessible blower section complete with slide-out blower. Refrigerant connections are conveniently located for easy service diagnostics. Low pressure/loss of charge protection is standard on all models.